Hello everyone, and welcome back to The Arcane Sanctum. I hope you all have enjoyed the new findings in Standard this weekend with the release of Rivals of Ixalan. There are some neat cards in the set that even I can’t wait to try, and hope they play as well as they look. As you recall last week we saw several cards banned in Standard, and this series of articles is not only a reaction to the reaction, but meant to help have a conversation about how we even got here to begin with. In part 1 I discussed how player feedback has had an impact on how the game has been designed, and how that design has led us to an era where the Creatures vs Spells paradigm is about as strongly in favor of Creatures as it was over 15 years ago in favor of Spells. In part 2 I looked at an example of a very powerful deck, how it’s impact changed how players (especially new) could view the game, and all the impact that Caw-Blade Summer has had on Magic as a whole. Today we’re going to talk about another way Wizards of the Coast would have been inspired to make changes, and attempt to stay on top of the CCG world. In 1993 Wizards of the Coast released Magic: the Gathering unto the masses at GenCon, and the gaming world as we knew it was changed forever. Developed as a game that could be played between RPG (especially Dungeons & Dragons) sessions the game itself has become THE collectible card game (CCG) to measure others to. Every other game designer was playing catch up, and the highway to our dollars became jammed. Quickly. Within the span of a few years hobby stores had to make room for these new games being published at whim. In a way this was a good thing as not only did Sports Cards take a hit during that time, but Comic Book sales were trying to turn the page away from debt with the various publishers. Anything that had some level of appeal could become (and did become) a CCG during that era. Intellectual properties from comic books (Marvel Comics & DC Comics Vs System), to television (Doctor Who, Decipher’s Star Trek, as well as WWE), and even new games (Warlord) were tapped for making into games. Popular movies (Star Wars) were brought to card tables to every galaxy in neighborhoods everywhere. It was also around this time that Wizards of the Coast started releasing expansions for Magic: the Gathering. While several of the first expansions (Arabian Nights, Antiquities, and Legends) drew a lot of praise some of their expansions during this era flopped with Homelands being one of the worst sets ever. It was also around this time that Wizards of the Coast encountered an issue with reprinting cards to provide access to those who got into the game after it’s initial release, and feedback from those who were their from the start. When Chronicles was released a lot of players were upset at the potential loss of value of their original cards, and thus we have what is now known as the Reserved List. I wonder what would have happened if Chronicles never existed? If there was no new product (even if it was Chronicles) on the shelves to counter the arrival of new CCGs what impact would that have had on Wizards of the Coast? One thing these sets such as Chronicles, Fallen Empires, and Homelands did was keep the brand of Magic: the Gathering visible to the every growing CCG enthusiasts as well as cement their place as the best CCG on the market. By the end of the 90’s Magic: the Gathering’s primary audience got older, and while entrenched their brothers, sisters, or even children were wanting to play this new thing called a CCG. At the same time a new fad had swept the nation: Pokémon. The cartoon followed the exploits of Ash Ketchum as he traveled the world in order to become the best Pokémon trainer in the world. He & Pikachu became as synonymous as Han Solo & Chewbaca, Bert & Ernie, and damn near any other marketable duo you could think of…and then some. Capturing the hearts and minds of a generation who would go on to be known as Millennials (including my daughter) Pokémon ruled the airwaves, and toy aisles for at least a decade. It was a no-brainer to make it a CCG. Wizards of the Coast published the first set of the Pokémon Trading Card Game (TCG) at the beginning of 1999, and it easily became a smash hit. Now when parents would go into hobby stores they had a game that their kids would want to collect, as well as play, and it wasn’t something deemed as “violent” as Magic. For those who may not be aware Magic had some backlash in the mid-90’s with their imagery as parents felt it was too demonic in nature. Creatures had the word “summon” on them, and the fervor around the game left parents feeling like there was a cult following of sorts. Keep in mind this was during the same time frame as the first Harry Potter films, as well as the arrival of Marilyn Manson into the mainstream FM radio stations. Parents were on the lookout to keep their children safe, and while understandable to a degree many went overboard with it. By obtaining the license to publish the Pokémon TCG Wizards of the Coast was able to provide a safe product that was aimed at kids, and backed by a daily cartoon series that already had some approval from many families. The game itself had some similarities to Magic: the Gathering. Cards could only be played if their corresponding Energy, not mana, cost was paid (not the Energy from Kaladesh folks). Cards had additional costs that required Energy, and the Pokémon dealt as well as received damage just like in the cartoon. The game was even developed with a fold out map to show where the cards were placed during play, and a CD-Rom to help learn how to play. One could argue that Wizards of the Coast spent more time with tutorials for this game than Magic, and it was a smart move. 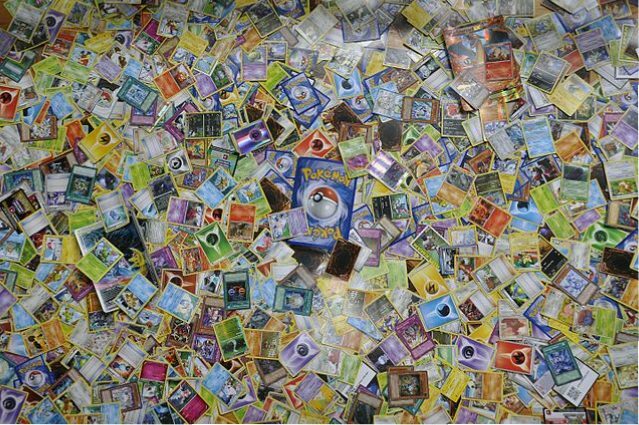 Many children who played the Pokémon TCG would eventually graduate to other games as they got older, including Magic: the Gathering. While Wizards of the Coast lost the licensing agreement to continue producing the Pokémon TCG (now published by Nintendo) it still flourishes to this day. Many who were kids when Pokémon was first released now have kids of their own who are experiencing this phenomenon for the first time, and with mobile phones a part of our daily lives people can virtually catch Pokémon in the real world via Pokémon Go (and more on technology’s impact in a later article). As the 90’s ended, and a new century began companies started to realize that not only did they have to provide quality product, but they had to provide a reason for consumers to stop enjoying what they currently do in order to give new companies a try. PC gamers were on the rise, and thanks (in part) to the success of the Lord of the Rings movies escaping to a fantasy realm of swords and sorcery was very ideal. Who would not want to explore a world where one can either fight an Orc, or play as one? You could also ride an animal, turn into one, or even raid with your friends…until one gets hungry for chicken, and then goes on his own. The World of Warcraft, a massive online role-playing game (MMORPG) quickly became a new world for many who grew up with Pokémon, Magic, Dungeons & Dragons, or…anything gaming, and then started to explore the world of PC gaming. Entertainment was all now housed in however big your tower was, and however long you could hold your eyes open. While the game had many benefits even Blizzard needed ways to keep their clients, who were subscribed to the game, coming back for more. While this of course led to more expansions, and additional content to the game, they did something that would have felt more at home a decade prior. They made a TCG. First published by Upper Deck in 2005 (who first started with baseball cards nearly 20 years prior), and then published by Cryptozoic Entertainment until the TCG ended in 2013, the WoW TCG seemed to have traits similar to both Pokémon & Magic: the Gathering. Taking images of popular characters made for the game, and an actual player as the card above, the game required using your resources to play your Hero card, and using the cards in your deck for support via spells, combat with allied minions, and equipment to achieve victory. Magic: the Gathering at the time was recovering from the nearly 2 year disaster known as the Mirrodin block, and those who had not returned to the game may have joined this one as a way to get their TCG fix. Unlike Magic packs the WoW TCG could provide an item code you could use in the MMORPG to obtain special cosmetic items, or even a mount. Pokémon even started providing codes to obtain a digital pack online so players could experience online play if they could not get game in with their friends. These two companies were finding ways to tap into an online audience, and have sales with a paper product too. This was the first time that Wizards of the Coast seemed to be falling behind the times. As the second decade of the 21st century approached Wizards of the Coast was able to counteract a lot of these competitors by providing access to Magic: the Gathering via Duels of the Planeswalkers, an online game of Magic that was also available on consoles. While this helped reach a new audience it didn’t provide the same level of play as a constructed deck of Magic in paper, or even in their other online (Windows only) client Magic Online (MTGO). The inability to tap into the ever growing mobile game market, let alone not even being recognized as a digital game in the sense that MMORPGs were, left Wizards of the Coast in catch up mode as Blizzard Entertainment announced the release of Hearthstone: Heroes of Warcraft. Hearthstone took the simplified feel of the WoW TCG, and simplified it even further for the mobile phone age. The game puts you in the role of the Hero, and you play your “cards” (digital objects really) on your turn, attack, and pass the turn. There were no instants that removed an opponents threats as there are in Magic, and this would become an important note going forward when reviewing design (more on that in the next article). The game quickly became popular, even to the point where one can see commercial spots for it on TV (you can’t say that for Magic these days now can you?). Anyone who enjoys TCGs now had a FREE TO PLAY TCG in the palm of their hands. Cards could be acquired by turning unwanted cards into dust to make wanted cards, winning packs via games, or buying using real money. The game would make money on micro-transactions (players buying gold to buy packs), and the various advertising slots it could find to draw new players in. The game became so popular it developed a way for players to play competitively, and is currently included along many of the other eSport games where professional players compete for cash prizes. Blizzard had developed a hit, and Magic was needing to (as the cast of the weekly Magic Mics podcast say) “get #datHearthstoneMoney”. Wizards of the Coast had strong competition in both Pokémon, and now Hearthstone. How would they try catching player’s attention to their product? Was their something with how these games played out that perhaps they could adapt? With the feedback from the Tournament Players, plus their issues with “best decks” taking up a large percentage of tournament play, what could they do to help make things more fair to players overall while attempting to keep things balanced? Also what benefit would going this way in design have? Could they still provide us solid mechanics while allowing for the construction of Aggro, Combo, and Control decks that have been the pillar archetypes of the game since it’s creation? …some would say no, and they would not be completely wrong. The desire to make creatures the focal point of tournament play would start pushing them to the point where it seemed like they came with spells attached to them when they entered play, but due to creatures (generally) only being able to be played on their controller’s turn it was an attempt to make things more “fair”. What perhaps was missed is the power level created going this direction that has now caused a lot of bans in the last year. However even with all of that said there is still one other influence that has perhaps led us to the design we see currently in the game. That will be the next article, and the last one in this series exploring how we have these issues in Standard (and perhaps other formats).